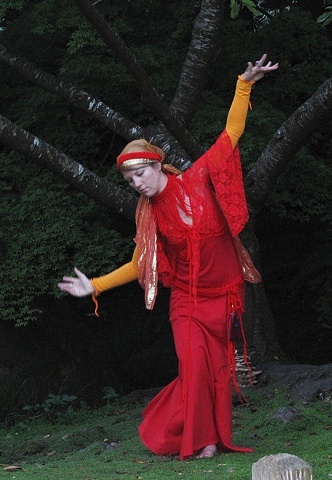 I had originally intended on doing the performance at the Japanese Tea Garden at Golden Gate Park. When I came to San Francisco with my parents when I was very young, my mom and I had gone to the Tea Garden and I have a very vivid memory of it and I thought doing the performance in there would bring that full circle. However, upon arriving there in full regalia, they only accepted cash and neither my or my photographer had enough to get in. we both took this as a sign that this was not meant to be so we went across the street to the botanical gardens, which, thankfully was free. We were walking around the find the perfect spot, a place that sparkled a bit above the rest of its surroundings that said, yes, this is where the performance needs to happen. After meandering for a little while I saw it, a mossy patch underneath a beautiful tree with several fruitings of gorgeous mushrooms. I went over there and after pausing a moment to feel the energy of the place, I began to move. Because of the nature of what I am doing, there are very few thoughts that happen during these performances. I don’t really notice what is going on around me in a cognitive way. I feel as though I am almost all perception and things just happen while I observe in almost an instinctual way. I did have a few realizations however, several thoughts that emerged from this emptiness in my mind and lingered for a bit so that I could understand their impact. I improvise like a jazz musician improvises, but my instrument is my body. Like jazz is slightly anti beat in its improvisational moments, yet all the while maintaining the beat pattern as its starting point, I do not have any beats happening in my head or anything I am really dancing to. There is always the central pattern of my heart beat which keeps my in a time signature of sorts, but I move freely around this regulatory measure, just as the notes in a jazz solo move around the original theme, deviating then returning, constantly evolving. I also have noticed, this being the third performance I’ve done, that each time I move with some element in my surroundings. The first performance at Ocean Beach, I moved with the undulating waves, letting the energies of tide, the sounds of the water, the swirling of the foam guide my movements as if they were my dance partner leading in a sophisticated tango. This time I moved with the energies of the moss beneath my feet. I found myself constantly looking down at the moss and I realized that it was in fact this energy I was performing with. I feel as though I am somehow the manifestations of these energies, that I become the conduit for their appearance in our visual reality. I keep myself open and unassuming, attempting to clear away my own self and let the energies of the space radiate through me. It is very personally meditative and trance-like, and in doing so I hope to create a sense of sacred space in the area that I perform in. Another thing I have noticed is that I seem to have an animal friend become one of the longer observers of the performance. The first one at Ocean Beach had a sea gull that literally stayed within 10 feet of me the entire duration of the piece. This one at the Park had a squirrel spectator that hopped around behind me, sat, then went up in the tree I was in front of and continued to observe from there. Perhaps that feel the energy that I move to, perhaps they wonder what is this creature that doesn’t frighten them but is nonetheless in their space. I think they are my harshest critics and their observations are my largest compliments. This series of performances is about the simplicity of happening upon something unexpected and beautiful. Beauty is an essential facet of our human experience, a momentary simultaneous realization of our fleeting essence in this world coupled with a sense of something eternal that last far beyond the transitory experience of the now. I hope to inspire a passerby with my simple gesture of beauty, to jog them out of their everyday and take a moment to appreciate their own experiences, their own lives, not even so cognitively concrete as that, but in a subtle wordless momentary understanding. I had several interactions which were quite amusing that were different this time than before. I think because the costume was red rather than white, people perceived it differently. I was asked what nationality I was. I never even thought that it looks like traditional folk dress, but the more I thought about it, the more that totally makes sense. It’s my own Hungarian aesthetic along with my favorite influences of gypsy and Indian costume that totally created this look. I also had someone snap a photo of me while I was just walking on one of the paths. I was looking away at something and happened to turn to see the man take a photo. He smiled cheekily and walked away. So I am now in someone’s travel photos.